Almonds have been revered as one of the most delicious and healthiest foods for hundreds of years. They are used in many national cuisines and offer a great energy boost if eaten as a snack. 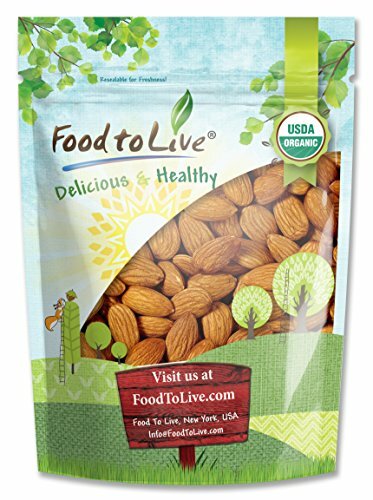 Food to Live Certified Organic Almonds offer all the health benefits of unpasteurized almonds. Nutritional Value Organic almonds are exceptionally rich in nutrients. They contain large amounts of: – Vitamin E – Riboflavin – Copper – Phosphorus – Magnesium – Manganese They provide you with a boost of antioxidants, as well as strengthen your bones, hair, and nails. Directions Store Food to Live Certified Organic Almonds in a cool and dark place, and they will remain fresh and delicious for months. Almonds can be added to a variety of dishes, especially to confections and desserts. You can enjoy raw nuts as a fast snack or turn them into delicious and healthy butter. You can even add them to smoothies and homemade protein shakes. This product is processed in a facility that also processes wheat. WARNING: Contains Tree Nuts!